Towering above the skyline just west of Woodside, CA, is a massive old-growth redwood. 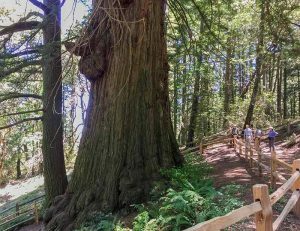 Its name is “Methuselah” and it is the oldest and largest living tree in the Santa Cruz Mountains (outside the trees in Big Basin State Park). It’s huge. When you first see Methuselah, it’s hard to fully comprehend what you’re looking at. It’s so massive compared to the other trees in the forest it seems like it should have a different descriptor – it feels like more than just a “tree”. After the initial shock of simply comprehending the size of this thing, you begin to really see exactly what it is you’re looking at. The sign at the foot of the tree helps, too. It estimates the tree to be over 1,800 years old. Yeah, sit with that a second. So why am I telling you this story? Methuselah’s story is the story of our open spaces. To know these stories is to know and love this place. Methuselah is conveniently located just a short walk off of Highway 35 (Skyline Boulevard) 3.3 miles north of Sky Londa and Alice’s Restaurant and 0.5 miles south of the Caltrans’ Skeggs Vista Point. The closest parking is across the road at El Corte de Madera Creek Open Space Preserve. Be careful crossing the road as cars can come around the corner quickly. Methuselah will be visible from the road. Pass through the gate and follow the trail to the base of the tree. Methuselah is now owned by the California Water Service Company and they have generously allowed public access to this portion of their land. Please be courteous of their property and leave only footprints. What Makes A Healthy Farm?